AnItalian military communications satellite that will be shared with NATO andallied countries went into orbit this morning atop an international rocketlaunched from a platform floating in the Pacific Ocean. The Sea Launch Zenit 3SLbooster began its unusually long but successful ascent carrying the SICRAL 1Bspacecraft at 0816 GMT (4:16 a.m. EDT), roaring into the sky on the commercialrocket's 30th flight spanning the past 10 years. The two Ukrainian-madelower stages of the rocket performed their firings to propel the Russian BlockDM-SL upper stage and SICRAL satellite out of theatmosphere during the first eight-and-a-half minutes of flight. The upper stage then tookover, completing an initial engine burn to reach an elliptical orbit thatstretched more than 8,700 miles high. The relatively light weight of thepayload coupled with the power offered by the rocket allowed the exceptionallyhigh orbit to be targeted instead of a lower, more typical parking orbit. The rocket coasted upwardson its trajectory for more than an hour, flying over South America and theAtlantic, before re-igniting for a three-minute firing to accelerate thepayload into a geosynchronous transfer orbit. The 6,700-pound satellitepayload separated from the rocket an hour and 49 minutes into flight overAfrica. The equatorial orbit achieved the pre-launch plan, with a high point of22,166 miles and low point of 5,348 miles. 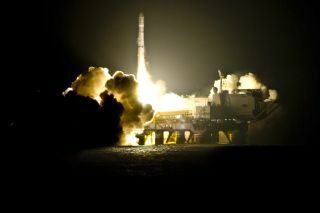 "Anotherpicture-perfect launch," said Kjell Karlsen, president and general managerof Sea Launch. "A great launch indeed." SICRAL 1B will use anonboard engine in the coming days to reach a circular geostationary orbit 22,300miles above the equator where it can match Earth's rotation and hover above onespot of the globe. That slot will be 11.8 degrees East longitude. The satellite will providethe strategic and tactical links for Italy's military, plus law enforcement andcivil emergency agencies. "We are using theSICRAL system to ensure homeland security," said Lt. Gen. PietroFinocchio, the Italian Ministry of Defence's general director of IT. SICRAL 1B was built byThales Alenia Space using the Italsat 3000 spacecraft design. It is equippedwith a communications package that includes three frequency bands. The extreme-high frequency(EHF) transmissions will be dedicated to infrastructure communications inItaly; the ultra-high frequency (UHF) serves mobile communications across thesatellite's wide coverage area; and there's five super-high frequency (SHF)transponders to handle voluminous communications over Europe and the MiddleEast. Attributes of SICRAL 1Binclude its nuclear hardening, encryption capabilities and securecommunications that guard against interference, said Luigi Pasquali, chairmanand CEO of Thales Alenia Space Italia. The first SICRALspacecraft, launchedin 2001, has about three years of life remaining. The new SICRAL 1B isdesigned to operate for 13 years. The satellites are known by the nativeacronym formed from the full name of "Italian System for SecureCommunications and Alerts." "We decided to provideourselves with satellite communications during the second half of the 90's whenthe Italian army's commitment in the world was increasing and it was necessaryto link the area of military operations to the homeland," said R. Adm.Filippo Maria Foffi of the Italian Ministry of Defence. "In 2001, we launchedour SICRAL 1 satellite. It was a great improvement, as it suppliedcommunications services on a constant basis and was no longer random. It alsobrought improvements to the national territory in the field of connectionsamong army, civil protection and the police force who were the first to usethis system." Under a public-privatepartnership with the Italian Ministry of Defence, the Telespazio company helpedfund the SICRAL 1B program in exchange for rights to some of the satellite'scommunications capacity. Telespazio will sell the services to NATO, as well asEuropean and U.S. military users. The SICRAL program, in collaborationwith military satellites deployed by France and the United Kingdom, fulfillNATO's needs for space-based communications.